Dimensions: as determined by the chief engineer. Clearance: at least 400 mm. 57 mm ZiS-4 gun or 76 mm F-34 gun in the turret, with a coaxial machinegun. Vertical angles: +25 to -5 degrees. 60 57 mm or 76 mm shells. Maximum highway speed: 45 kph. Average highway speed: 30 kph. Average off-road speed: 20 kph. Armour: rolled homogeneous, high hardness. Front: 45 mm, at least at 60 degrees. Side and rear: 40 mm. Turret: 45 mm, with an angle of at least 30 degrees. Engine: diesel. One or two 110 hp motors. Sufficient fuel for 12 hours off-road driving. Elevation and depression: up to 35 degrees. Armour: rolled homogenous, high hardness. GVG machine gun in the tank's front. AA machine gun in a rotating mount above the commander's cupola. 3000 machine gun rounds for the GVG. Elevation: at least 40 degrees. Tilt: at least 30 degrees. Maximum crossable trench: 2200 mm. Maximum fording depth: 1200 mm. Fuel tanks: at least two in the lower parts of the hull. It is forbidden to place tanks in the crew compartment." Wow, what a requirement! 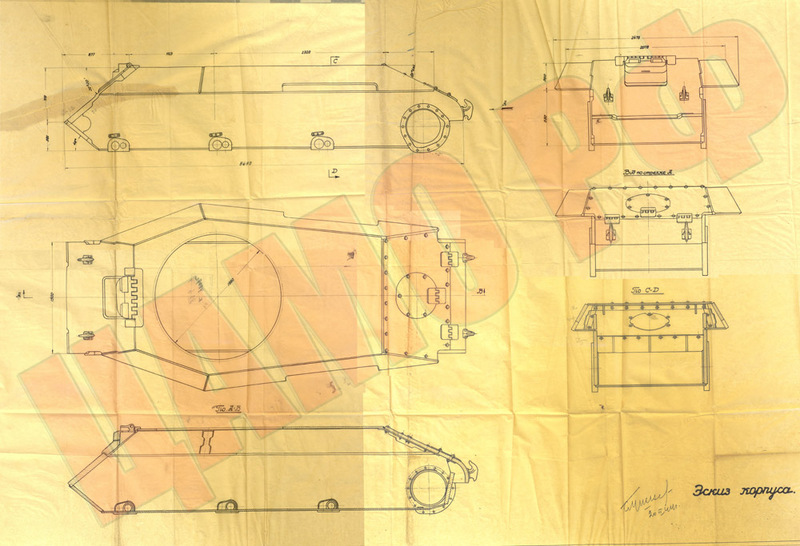 75 mm of front armour is how much a KV had. This is really getting into heavy territory. The "76 mm gun with AA ballistics" is the S-54 gun meant to go in the T-34 as a stopgap measure before the T-34-85 started rolling out. Factory #174 did not disappoint, and put out a successor to the T-50. An interesting component of the design is the road wheel setup. Unlike with most designs where each wheel gets its own torsion bar, this tank's torsion bars carried a bogey with two wheels each. But that's not all! In 1944, the requirements were inflated yet again. Most of the tank's characteristics remained the same, with the exception of the armour. The front grew to 90 mm at 62 degrees. The front of the turret, to 90 mm at 30 degrees. The sides also increased to 90 mm at 45 degrees. The armament increased to the S-53 85 mm gun. The tank's mass grew to 23 tons. At this point, the tank was easily encroaching on medium tank territory, both in mass and armament. Instead of making the mistake of chasing a ridiculous light tank again, factory #174 pursued the manufacture of T-34-85s. Tier V Soviet light replacement in WoT?